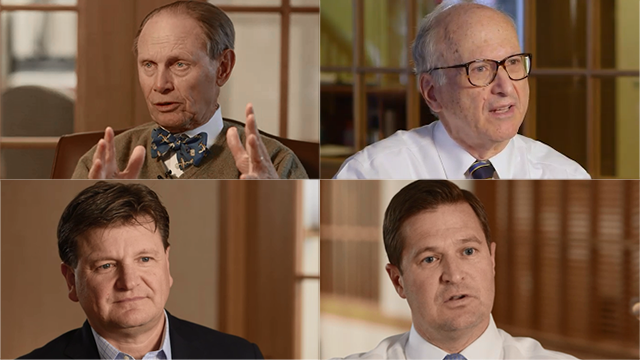 Four small-cap specialists consider the change in leadership from growth to value within the asset class. Do you think value's leadership in 2016 was a regime change? Is it likely to last? Chuck Royce: These trends are multi-year trends and we really only had a year or so of the major trend to value. More importantly, earnings in this wonderful sector, in the value sectors, they're doing fine, they're making progress. Rates are normalizing, which is one of the reasons why the high growth did very well was that rates were very compressed. You were allowed to pay ridiculous amounts for non-earning companies because you could think long-term, because you had that duration. To me, that's probably the most important reason why value will persist here and you know, we'll get going again in the next three or four months. Charlie Dreifus: The question remains is the market going to respond as it generally does over time to the underlying strength in the economy? And if the economy weakens or just doesn't decisively move ahead, then the regime change can go back again. Small caps, rightly or wrongly are assumed to respond to fiscal domestic kind of growth. Without some continued expectation that we move along those lines, it can be challenging. The simple answer is we just don't know yet. But it has to be watched. Bill Hench: I would think that we would get at least another good period here of favorable value results. I think to a large extent there was catch up, especially on the microcap side, which is still not performing as well as I think it can be. But I think to a certain extent, there was just so much going on in the macro that we really don't have a clear picture of just how good things get or how bad they were. '16 was good to start with because we were starting out at a low base, so you had very poor results for small cap value in '15. Expectations were very, very low. However, balance sheets were improving, capital was still available and the domestic economy was doing a little bit better I think than most people had anticipated. Add in the fact that Europe and Asia were not nearly as bad as the consensus had them out to be and you had a great set up for these stocks to do well. When the election came and there was a perception of regulatory reform, and tax reform and possibly an infrastructure bill that just fed that. So the only thing that really happened was a big change in perception. A Pause and a Reversal? Steven McBoyle: We have to put time into context here. Really, for a five-year period, if you will, leading into June of 2015, growth outperformed value by a significant order of magnitude and we know why that was. We were faced with an environment that was one of low growth and so the market effectively reached, if you will, for growth. But that pendulum began to swing quite significantly, beginning June 2015. We've had a period of time coming off the bottom of 2016 where we saw that reversal, small and value outperforming, leading into the end of 2016, where I think the market may have been a little overconfident. So, we have a period of time here in the first quarter of 2017 where we've got a pause and a reversal. But again, if we put into context the backdrop where the order of magnitude and duration to which growth had outperformed value, and then the fact that we do have this transition period where we're shifting from monetary to fiscal stimulus, I'm not saying that that transition is going to be smooth, I don't actually expect it to be smooth, but we will get it right. And when we do get it right, ultimately there will be positive, cyclical reflationary forces that are going to continue once again after a period of time, a pause where small and value will once again outperform. The thoughts and opinions expressed in the video are solely those of the persons speaking as of April 5, 2017 and may differ from those of other Royce investment professionals, or the firm as a whole. There can be no assurance with regard to future market movements.